An architecture of government adaptation programs is presented. Components include leadership, institutional organization, stakeholder involvement, climate change information, appropriate use of decision analysis techniques, explicit consideration of barriers to adaptation, funding for adaptation, technology development and diffusion, and adaptation research. 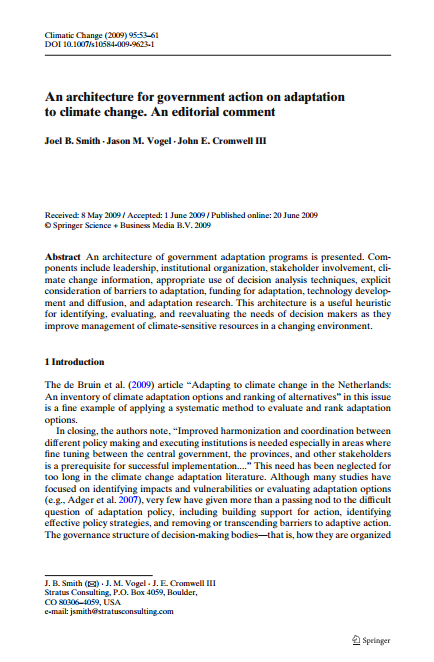 This architecture is a useful heuristic for identifying, evaluating, and reevaluating the needs of decision makers as they improve management of climate-sensitive resources in a changing environment.